So here you are…. sitting pretty with a new business, or even a brilliant business idea. The first big step is to make this brand come alive, from your mind to the mind of others; and utilising the skills of a graphic designer is your first point of call. But is it’s vitally important to know some basics yourself, because sooner rather than later, you will be presented with some brilliant logo concepts, but what path will you pick to express the message of your business? So here is how it works? You find your graphic designer, someone who has the same creative aesthetic as you, someone you (hopefully) “click” with, and someone who is within your business budget. The (fantastically talented and tuned in) designer makes the creative magic happen, coming up with usually around 3-5 logo concepts for you to choose from… BUT WHAT NOW? Here is the million dollar question. Sometimes one of those concepts will smack you across the face, you will instantly fall in love and the problem and it is completely solved all at once. But you wouldn’t be here reading this if this were your situation. So here is what I recommend, a process of elimination…. Eliminate first? Are there any concepts that you don’t like? Remove these from your selection process. Readability. Eliminate any option that you find hard to read. Size. If the logo is reduced to under 10cm in size, is it still readable and recognisable? If not, eliminate. 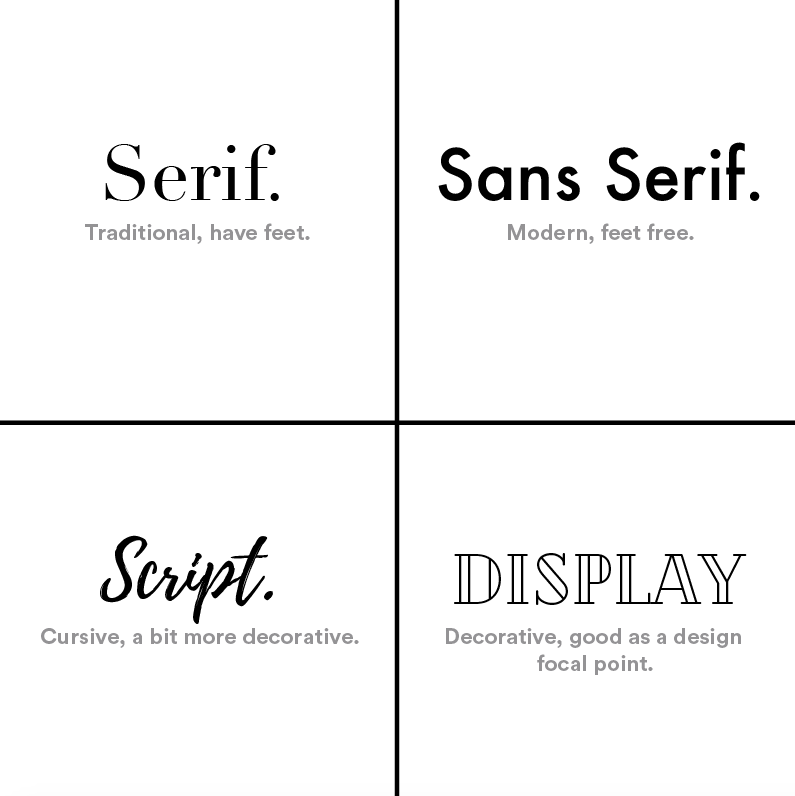 Fonts. Which fonts do you like the most? Which are the easiest to read? You can use the chart below to help you define what you do and don’t like. Eliminate any that do not sit with your brand ideals. Reversible. Can the logos be placed on a black background and be read in white? If not, this may not be the most versatile option of you? The message. Does the logo concepts purvey the message of your business? It seems pretty simple right? Not at all. I sometimes sympathise with my customers having to choose between great and outstanding! It isn’t easy…. Go to bed and have at least 24 hours before you make the final decision. I’ve only ever had one client change their mind after the fact, and it wasn’t an easy (or cheap) process changing everything over!